Come see your fellow Tufts students represent their political clubs - Tufts Republicans, Tufts Democrats, and Left Unity Party - behind the podium. Focus will be on current policy solutions and the big issues facing American politics. Hope to see you there! Join Tufts CIVIC for our first social of the semester to ring in the new school year. There will be food and beverages and also a really fun trivia game. You are welcome to sign up a team in advance or be placed on a team the night of. Join us for a fun evening and get to know CIVIC a little bit better! Welcome to the first CIVIC meeting of the semester! Join us to eat pizza, learn more about the exciting events CIVIC has planned for the year, and participate in an exciting political discussion. We hope to see you there! 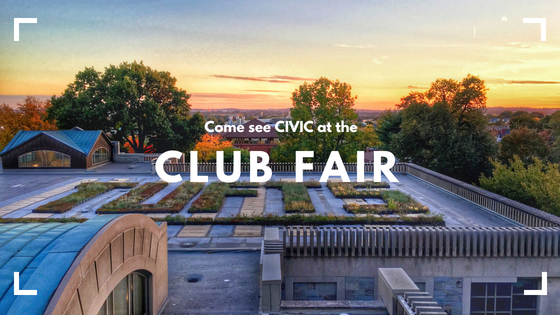 Come check out what CIVIC has to offer at our table at the Club Fair! We'll be giving out flyers, introducing the new e-board, and giving more information about our upcoming General Interest Meeting.